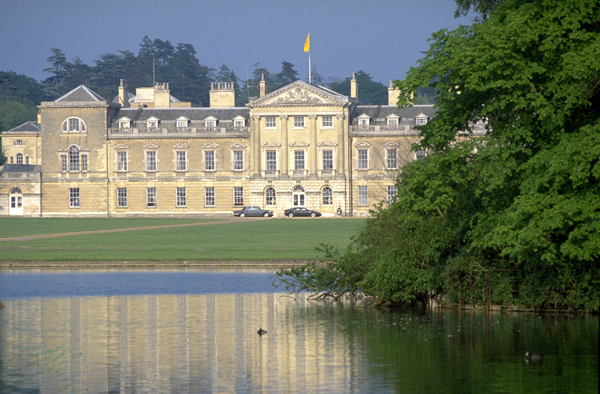 Woburn Abbey dates back to the mid-1100s. As I drove through England on a balmy day in late May, I found it hard to concentrate on driving on the “wrong” side of the road because the countryside constantly drew my attention. Meadows and crops in all shades of green covered the hills like patchwork pieces stitched together by tidy hedgerows, with fields of rapeseed adding bright yellow accents. Castle turrets peeked over the tops of trees and every small cottage we passed seemed to be vying in a garden contest. By the time we reached the Woburn Estate in Bedfordshire, an hour north of London, I thought nothing could surpass the beauty we had seen. I was wrong. The estate is postcard perfect. A regal great house of dove grey stone fronts on a large lake, surrounded by 3,000 beautifully tended acres where herds of rare deer graze in the shade of massive oaks. Woburn Abbey is no longer an abbey. Cistercian monks occupied it from the mid-1100s to 1538, when the abbot was hanged for treason from one of the big oaks. 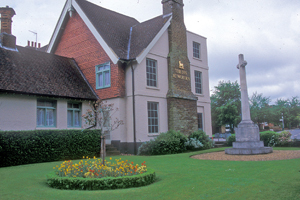 In 1547 Sir John Russell was granted the estate for his services to Henry VIII, and it has been the family home since 1619–almost 400 years. The late 14th Duke of Bedford ( known for much of his life as Lord Tavistock) brought golf to Woburn in the 1970s. Following the success of the Duke and Duchess courses, the Marquess course (7213 yards, par 72) was added in 2000. Oaks, beech and chestnut trees dominate the Marquess layout, which follows a plateau with superb views of the countryside. It is wider than either of other two tracks, but contains plenty of perils. The greens are large and sculpted, with bunkering often set far enough back to require long, difficult approach shots. The Duke’s (6,940-yard par-72) and Duchess (6,651-yard, par-72) courses were designed by Charles Lawrie and opened in 1976 and 1979, respectively. The venue for several fine tournaments including the Women’s British Open and the British Masters.. The course is daunting, especially for women playing from the 6,060-yard forward tees. One of the most televised holes in British golf is the par-3 third at the Duke’s, often listed among the top 500 holes in the world. 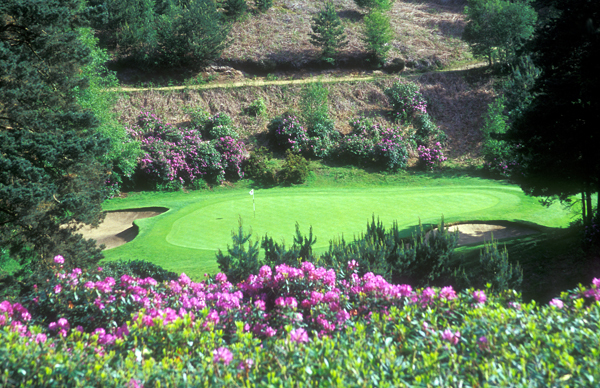 From a high hillside tee, it is 130 yards across a wall of rhododendrons and a ditch to a medium-sized green flanked by bunkers. Behind the green is a thicket of purple rhododendron, bracken, and pine. The Duchess course is shorter than the others but its tight, tree-lined fairways deal harshly with wayward hits. Hole 15, a 485-yard dogleg par 5, is typical of what makes the Duchess a delight for avid shot-makers. Any drive not arrow-straight ends up in the trees, and a short drive sets up a blind second shot. The left-sloping fairway runs downhill, then rises sharply to a two-tiered green. Golf is just one of the pleasures of a stay at Woburn. One could easily spend a week exploring the place–and many guests do. For those who need a bit of shopping or nightlife, London is only an hour away by train. The estate’s Inn at Woburn is THE place to stay. Built in 1724 to serve Royal Mail coaches, the Inn has been elegantly refurbished and offers 48 guest rooms. Olivier’s is the hotel’s award winning restaurant. The informal Tavistock Bar serves light meals and drinks. Though it is still the home of the Duke and Duchess of Bedford, Woburn Abbey is open to visitors from March until the end of October. The house contains one of England’s finest collections of art, furniture, silver, gold and porcelain. A stroll through the beautifully preserved rooms is an enjoyable and memorable lesson in English history and world art–and a perfect way to spend a rainy afternoon. The gold and silver pieces are particularly stunning, as are the views of Venice painted by Canaletto in the Venetian Room. For more information on Woburn golf, see www.woburngolf.co.uk. For information on the Inn, see www.woburnabbey.co.uk.